Bermondsey Central Hall Methodist Church serves a diverse congregation of about 320 and houses the South London Mission, which has been supporting the community since 1889. The modern London Shard skyscraper rises behind the church. Editor’s note: Part of an occasional series of stories, “British Methodism: Staying relevant in Wesley’s homeland,” about today’s Methodist Church in Britain. Baffoe was an active part of the Methodist congregation. But he saw lots of people “fall through the net” in those days, including some of his friends. Because of that, the 35-year-old takes satisfaction in being able to offer hope to the community through his role as faith and community development officer for Bermondsey’s South London Mission. Both the church and the mission, he says, provide the “good news” and spirit of Jesus in the community. That’s exactly the kind of spirit that Wesleyan Methodists wanted to invoke, back in the late 19th century, when the church realized there were poorer classes of people they simply were not reaching. So — in what had been one of the worst districts of London — the Methodists opened a grand hall, complete with a 2,000-seat sanctuary, in September 1900. A group of African women affectionately known as "the aunties" share prayer books during a praise service at Bermondsey Central Hall Methodist Church. The women form the backbone of the congregation according to their pastor, the Rev. Janet Corlett. From left are: Frances Dakowa, Omo Harris, Kayode Cline-Thomas and Joyce Davies. Peter Baffoe grew up in the area around Bermondsey Central Hall and remembers a time when it was considered unsafe. He now serves as faith and community development officer for Bermondsey’s South London Mission. Behind its Victorian façade, the building is re-configured now, but still serves as a base for the church’s South London Mission, which was established in 1889. It’s also home to a growing congregation. Historically a white working-class area, the north part of the borough now includes first-generation West Africans, second- and third-generation Caribbean natives, Eastern Europeans and an emerging Spanish-Latin American community. It also includes both expensive apartments and social housing for low-income families. The majority white and elderly Bermondsey congregation of the late 1970s is now majority African of all ages. Of its 320 members, half are from Sierra Leone, reflecting a large migration to England following that country’s civil war from 1991 to 2002. Another 30 percent are from Ghana. The remaining 20 percent include Nigerians and people from Zimbabwe, Zambia, Kenya and South Africa, according to the Rev. Janet Corlett, Bermondsey’s minister. The Rev. Janet Corlett (right) takes part in a prayer and praise service at Bermondsey Central Hall Methodist Church. “Of course, now we have a growing number of second-generation members who are well and truly children of London but whose parents are from elsewhere,” she said. In a way, she, too, is an outsider, having grown up on the Isle of Man, a self-governing island in the Irish Sea between England and Ireland, and having studied or worked in places as diverse as the Philippines, India, Italy, Zimbabwe and Honduras. On a busy Wednesday in early December, the church’s doors were wide open and Bermondsey Central Hall was full of activity. A morning prayer and praise service included about 10 of “the aunties.” These older African women form the backbone of the congregation — women like Remi Solanke, who was raised Methodist and moved to the neighborhood in 1992. The retired civil servant has lived in London more than 40 years and has children and grandchildren here but goes back to her native Nigeria every other year to visit. The aunties can be there when Bermondsey’s working members cannot, Corlett said. They turn up regularly for Bible class, run the prayer and praise service, take the lead for the over-60s exercise class, volunteer at the night-shelter and make sandwiches for the youth brigade. Eric Bediako (left) leads a Bible study with Judith Alpha (center) and Joyce Davies at Bermondsey Central Hall Methodist Church. 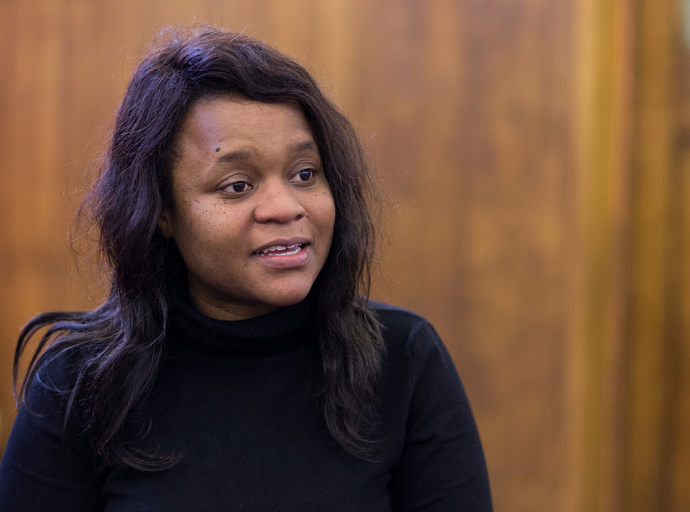 Daphne Sawyer lives at Cluny Place House, a hostel run by the Bermondsey South London Mission that offers short-term support and a safe space for people having trouble finding an affordable rental. After the prayer service, the group moved to a corner of the building where the “Pop-In” lounge offers hospitality. Open on weekdays from 10 a.m. to 2 p.m., the Pop-In also serves as a neighborhood welcome spot for the South London Mission. To address housing needs, the mission runs a hostel called Cluny Place House — similar to a student residence hall — that offers short-term support and a safe space for people, especially singles, having trouble finding an affordable rental. It also generates income for the mission. Particularly affected are those who don’t qualify for social housing, those who, “despite the fact they’re working a good job, can’t afford high London prices,” said Peter Baffoe. Daphne Sawyer, a resident at Cluny Place since 2009, fits that description. Both she and her husband, Edward, are university graduates but, she noted, West Africans often don’t get jobs they are qualified for. Sawyer was living in East London when she lost her job and was evicted from her previous residence. Her husband had worked for a teaching agency as a substitute teacher but those jobs dried up. He currently is employed as a painter at a hospital. The Rev. Janet Corlett (left) welcomes Frances Dakowa for a prayer and praise service at Bermondsey Central Hall Methodist Church. Winnie Baffoe heads the “Mummies Republic” program for young mothers at Methodist-run South London Mission. 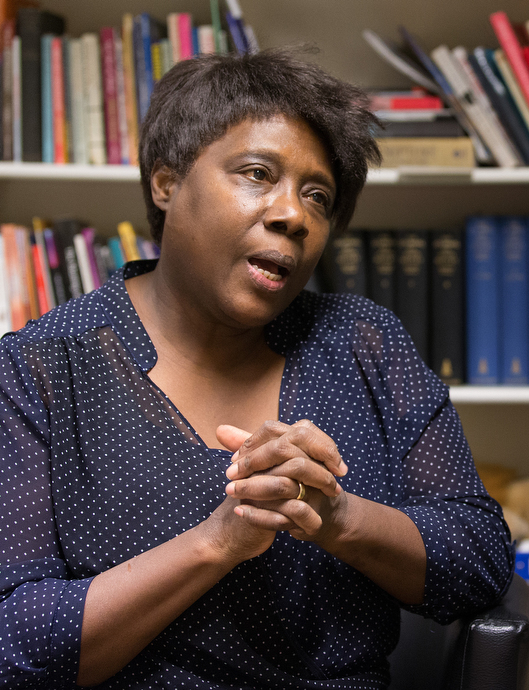 The mission also connects with young mothers through “Mummies Republic.” Winnie Baffoe — employed by the church as a “Fresh Expressions” pioneer worker and married to Peter Baffoe — developed the program as part of her “T-Rooms” project for Fresh Expressions, an initiative for church revitalization. She works with FareShare food bank, a South London Mission partner, and the London Borough of Southwark’s mental health team and heath visitors program. Some of the mothers take part in “Talking Therapies,” a trial program at the mission being monitored by the National Health Service to see if it could work at other faith-based institutions. 16 young people share their experiences before being confirmed at Bermondsey Central Hall Methodist Church, Pentecost, 2017. Winnie Baffoe talks about helpimg createT-Rooms, a quiet place for families and inidividuals to commune with others and with God. View photos on our Flickr page. Read more from our series on the church in England, Brtitsh Methodism: Staying Relevant in Wesley's Homeland. A focus on young people has been a common thread throughout the church’s and mission’s history. In 2011, Corlett started the Boys and Girls Brigade, a youth program particularly strong in the Methodist, Baptist and Presbyterian traditions, at Bermondsey Central Hall. More than 30 children aged 4 to 11 take part every Wednesday. “It has become a key part of our ministry to young people and families in the neighborhood,” she said. There is a youth club and other activities for older teens and on Saturdays, Peter Baffoe said, they “hire a pitch” at a local school for football. Last year, the church had 16 teenagers — 13 boys and 3 girls — in its confirmation class. Thirteen of the confirmands had been baptized at Bermondsey, “so we had, in a way, fulfilled our baptismal promise as a congregation,” Corlett noted. One of the active young people is Winston Shaw, 17, of East London, who was taking advantage of the empty sanctuary that Wednesday afternoon to practice the organ. “I try to repay my love for God through music,” explained Shaw, who will be attending university during the next academic year and plans to go into teaching. Later that day, he would volunteer with the Boys and Girls Brigade. “The thing about this church congregation is we’re family,” Shaw said. “I think it’s the love that binds us together." Winston Shaw, 17, stops by after school to practice the organ at Bermondsey Central Hall Methodist Church. “I try to repay my love for God through music,” Shaw said. Bloom is assistant news editor of United Methodist News Service and DuBose is a photographer for United Methodist Communications. Contact them at 615-742-5470 or newsdesk@umcom.org. To read more United Methodist news, subscribe to the free Daily or Weekly Digests.